Erm, apparently I mis-dated my update last week. It’s a little late to change it now, so I’ll just leave it alone. In any case, it’s Monday again, and I have a couple of new features for you on Protagonize. This week’s featured author is intoalkaseltzer, a 27-year-old journalist joining us from Canada. 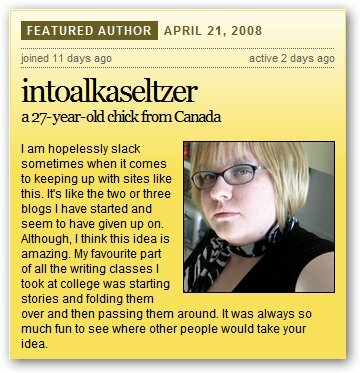 intoalkaseltzer has posted one story and two branches or chapters since joining the site, in addition to posting 2 comments, and she has a 4.00 average rating based on 3 ratings from other Protagonists. Congrats! You can check out intoalkaseltzer‘s profile here. You can view there rest of “Outsmart” here. I’ll also be posting a little more detailed of an explanation as to how I go about picking features sometime in the next day or so. Keep an eye on the blog if you’re interested in being featured in the future! Any ideas or suggestions? Feel free to comment here and let me know. This entry was posted in General and tagged Editor's Picks, Features, george carlin, protagonize, roundup, vacation. Bookmark the permalink.